Info "Is it a dude, a peach, or a shoe?" Mind the Gap is one of Orbulon's microgames in WarioWare: D.I.Y. The name of this microgame is similar to the phrase "mind the gap", that is used as a warning to train passengers when they cross a hole while entering a train. The point of the game is to figure out what item flies across the screen. The game starts off with an item flying across the screen. 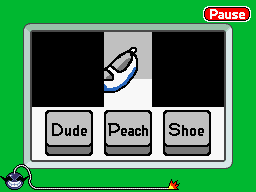 The player needs to decide if the item was a dude, a peach, or a shoe. If the player guesses correctly, the game is won. However, if the player guesses incorrectly or time runs out, the game ends in a loss. This page was last edited on July 18, 2018, at 22:27.